Dealing with anger is especially difficult when the anger and rage outbursts happen again and again. This is known as anger addiction or rage addiction. These patterns are hard to stop, and the results are devastating to everyone involved. You don't have to live like this. Life isn't supposed to be this hard. Keep reading this page, to learn how to break the cycle of anger and rage addiction in your life, whether it's you with the problem or someone close to you. 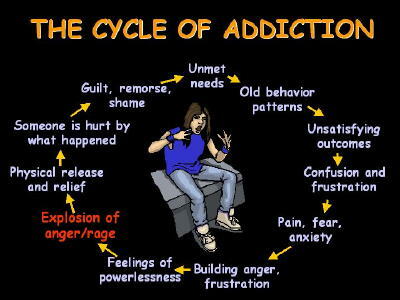 Take a look at the diagram above to get a picture of how the anger addiction pattern occurs. You can see that it goes around and around, repeating the pattern over and over...except that over time it usually gets worse. Things just don't feel right. You can deal with these problems, because you're a good person and you have what it takes--believe in yourself! Get started now on dealing with anger and breaking the addiction cycle and becoming your own best anger management resource. Things just don't feel right. You're not getting what you want. These feelings might go back a long way, even into your childhood. You've done everything you can, and it's not any better. They (the other people in your life) just don't get it, and they don't understand you. Your frustration and pain are building up inside, but you're not talking about it. You're always dealing with anger inside, but you have a hard time talking about it. You are getting madder and madder inside. You've never been that good at managing anger. So it just gets stronger. You're feeling stressed and irritated and your fuse is getting shorter. And finally you blow up. And when you blow up, somebody usually gets hurt--emotionally, physically, or both. This is not what you want, but it feels out of control, like something takes over. You might be getting into a pattern of bullying or Intermittent Explosive Disorder. You feel a little relief after you blow up, like a pressure has lifted. You might even feel a little euphoric. But then you look around and see the damage. The ones you hurt are probably the people you love. You promised you wouldn't do it again, and here you are. You really don't want to hurt them, but it keeps happening. You just wish they'd "get it." You feel bad for hurting and scaring them, but you may not be good at apologizing. Even if you apologize, it doesn't seem to help. They don't believe you. You probably think you were right, or somehow justified with your anger. You might be telling yourself they had it coming, blaming them for you anger outburst. Ultimately, you're not feeling any better than before. You're still not getting what you need, and it might even be worse. You had your blowup, so you feel some relief from the built up pressure inside. You're in the "calm after the storm." But in the back of your mind, you know it won't last. This is anger addiction. Dealing with anger doesn't have to be this painful. How Do You Break The Anger Addiction Cycle? Understand and take care of your own unmet needs. First, learn about the basic emotional needs we all have as children. There's a wounded child inside every anger addict, even though they may not know it. A very effective way for you to meet your own unmet emotional needs is by nurturing your inner child. As you get better at taking care of yourself and feeling better all around, you will find your love relationships becoming much more comfortable. Figure out what your patterns are in your relationships. Get some help from our books, counseling or anger programs to help you identify those patterns. Learn how to provide release and relief for yourself from the anger that causes your blowups. This is a very powerful way of dealing with anger and breaking the anger addiction cycle. Getting plenty of exercise, eating a healthy diet, relaxing or meditating helps a lot with taking care of yourself emotionally. Getting a good night's sleep is absolutely necessary for good anger control. Learn how to get your anger and rage out in healthy ways. This will break the anger and rage addiction cycle every time. Healthy anger expression is a must for lasting freedom and dealing with anger in healthy ways. Find out how healthy anger can work for you instead of against you, fueling powerful, positive action that makes your life and relationships better. Ready To Start Dealing With Anger In Healthy Ways? Anger can be healthy, rage never is healthy. Anger can be expressed in healthy, controlled ways for good outcomes, while rage is always destructive. Rage always has some anger mixed in, but a lot of anger does not contain rage. Anger can be simple and straight-forward, while rage is a complex mix of anger, fear, panic and desperation, as with people suffering with PTSD. People often remember what they said and did while they were angry, but after an extreme rage attack they will frequently forget what they said and did--this is sometimes called a "blackout," similar to what happens when a person has been drinking heavily. As you can see, there are major differences between anger and rage. However, when patterns indicate anger addiction, the differences become less clear. That is, when you're dealing with anger addiction, you are very close to rage. 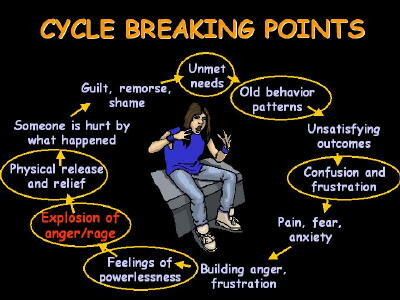 Dealing with anger addiction and rage addiction by breaking the addiction cycle is one of the most powerful ways you can take charge of your emotions and improve your life. Remember that you've got what it takes to manage your anger and reach all of your goals! 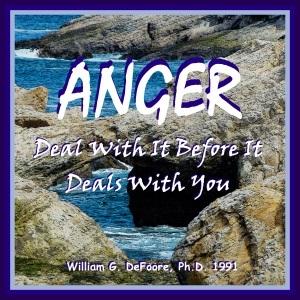 Learn even more about dealing with anger.